Vakkaru Maldives is a 25-minute seaplane ride away from Malé International Airport. 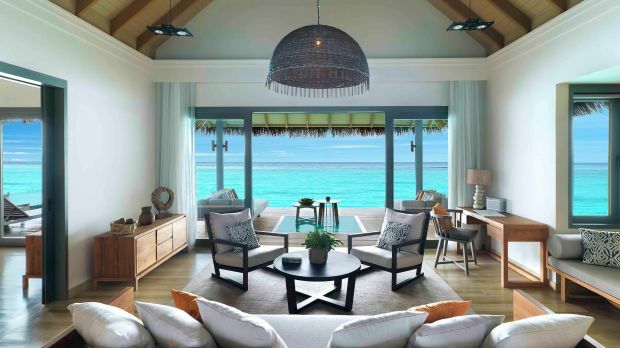 The 125 beach and over water villas overlook rows of coconut trees and the turquoise waters. With one to four-bedroom options, Vakkaru is equally adept at handling an intimate couples retreat, or larger groups of family and friends. As the plankton blooms from May to November, they attract feeding manta rays and whale sharks to the area. From manta ray snorkeling to diving, the island offers an abundance of acquatic activities. For a more relaxing day, the over water Menara Spa features facial and body treatments, along with yoga to refresh the body, mind, and spirit. Guests may spend the day soaking up the sun with a cold drink in hand at the poolside lounge, Cabana. With four restaurants and two bars, the hotel’s dining options covers flavors from Asia to Europe, made with handpicked fresh organic ingredients from the Vakkaru farm. To end the night, the above-water Lagoon Bar serves creative cocktails and light snacks. 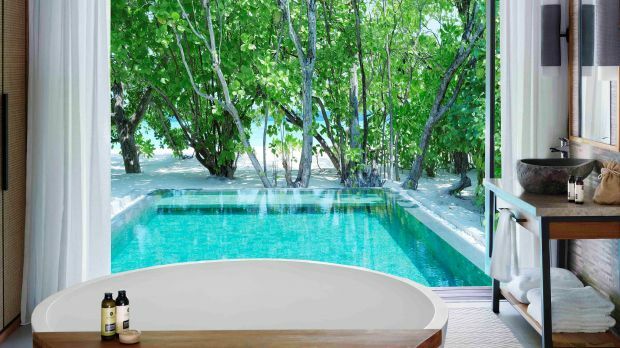 Send an availability request with your requested dates to the Vakkaru Maldives. 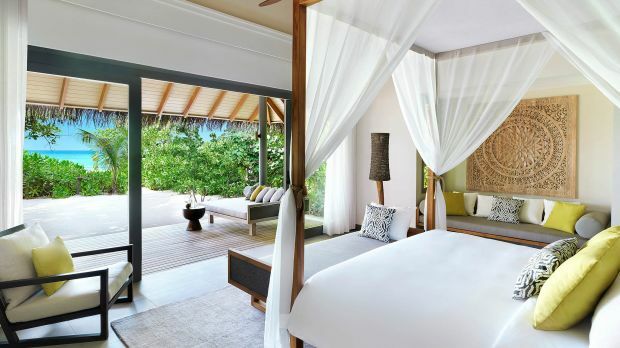 Nestled between swaying coconut trees and lush foliage, Beach Bungalows with indoor and outdoor showers are perfect for couples who want to step straight off the deck and feel the soft white sand between their toes, before plunging into the turquoise waters of the lagoon. The ultimate romantic hideaway set over the turquoise lagoon, Over Water Villas are elegantly designed including indoor and outdoor showers for two adults looking to appreciate the wonder of their aquatic surroundings. 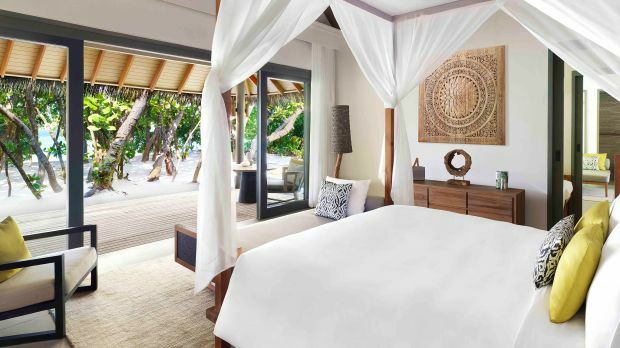 The ultimate romantic hideaway set over the turquoise lagoon, Ocean Villas are elegantly designed including indoor and outdoor showers for two adults looking to appreciate the wonder of their aquatic surroundings, close to the snorkelling points. Picture perfect accommodation for families wanting to share the unique experience of staying above the emerald waters. 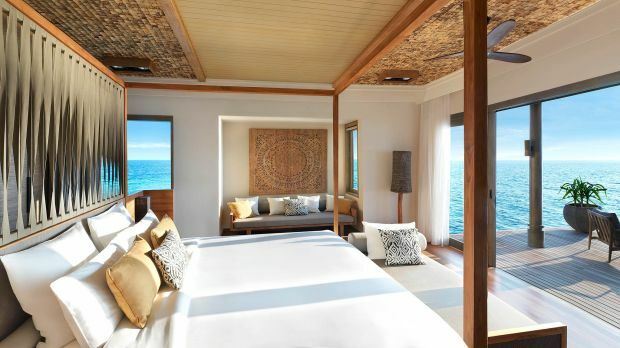 The Over Water Family Villas feature the same exclusive design as the Over Water Villas, plus a separate sleeping area for two children and a day bed in the parents’ bedroom area, allowing a family with up to three children under 12 years to relax in exceptional comfort. Perfect for couples who wish to have a larger room at 250m2 including plunge pool, direct lagoon access, butler service, bicycles, indoor and outdoor showers. 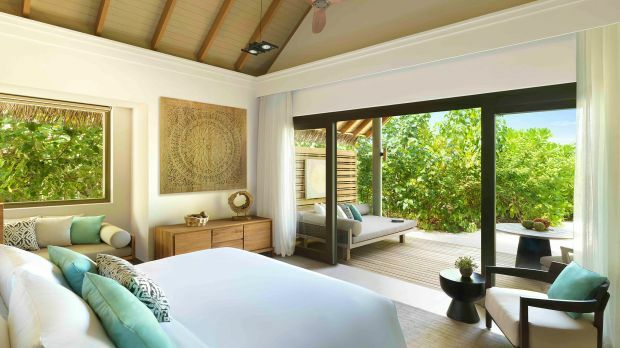 Featuring the exclusive design characteristics of all guest villas, plus a separate sleeping area, the villas provide the ideal space to relax and enjoy a sublime stay. Perfect for families with small children, 250m2 including plunge pool, direct lagoon access, butler service, adult and child bicycles, indoor and outdoor showers. Featuring the exclusive design characteristics of all guest villas, plus a separate sleeping area for two children and a day bed in the parents bedroom, the villas provide the ideal space for a family with up to three children under 12 years to relax and enjoy a sublime stay. The villas offer a wonderful sense of seclusion outdoors and a sociable space within, perfect for families with up to 4 children or two couples, with one king and one twin bedroom and an interior interconnecting door. Enjoy the same luxurious surroundings as the Beach Pool Suite, however, the 32m2 private pool is situated in the rear garden if you’re seeking total privacy and a little extra space. 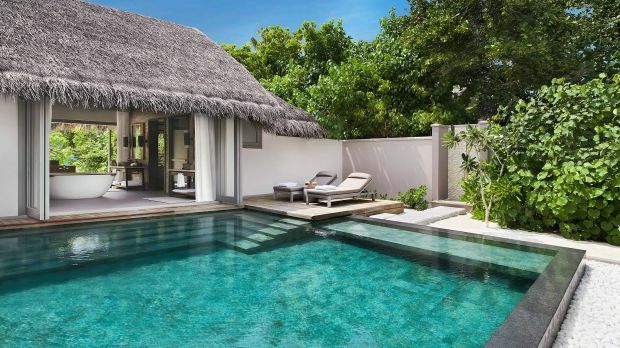 The serene space of Beach Villas, The Beach Pool Suite has been enhanced even further with a separate indoor living room and 32m2 private pool. 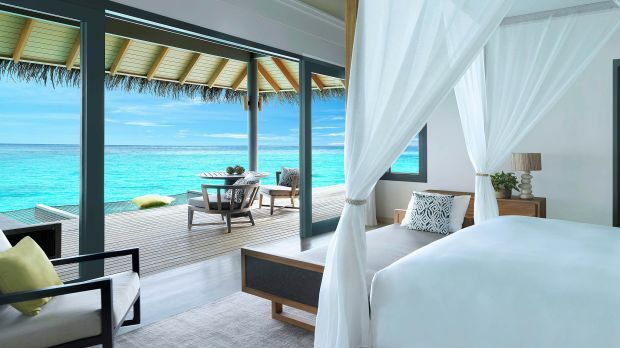 The bedroom, living room and bathroom all face out to the azure waters of the lagoon. 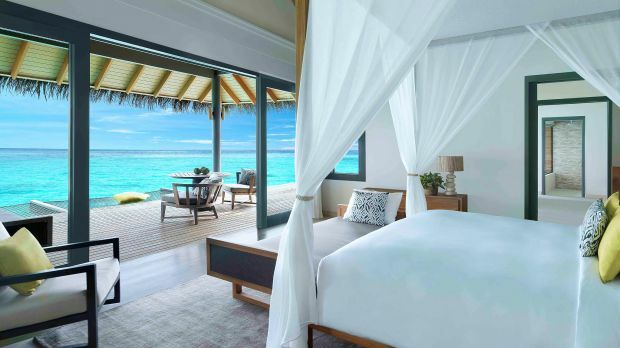 All the pared back luxury of our Over Water Villas, with the addition of a 50m2 private pool, separate living room, pool, bedroom, living room and bathroom all facing the azure waters of the lagoon. This magnificent two-story over water residence is a decadent sanctuary with direct, uninterrupted views of the sunset and located at the end of the Over Water Villas to ensure total privacy. The Residence features a 55m2 private pool. Ocean views from all rooms, Indoor and outdoor showers, Private over water terrace, Spa terrace, Living room, Dining room, Butlers pantry, Two king bedrooms, Two twin bedrooms, Day beds and space for family and friends of up to four adults and four children or eight adults.